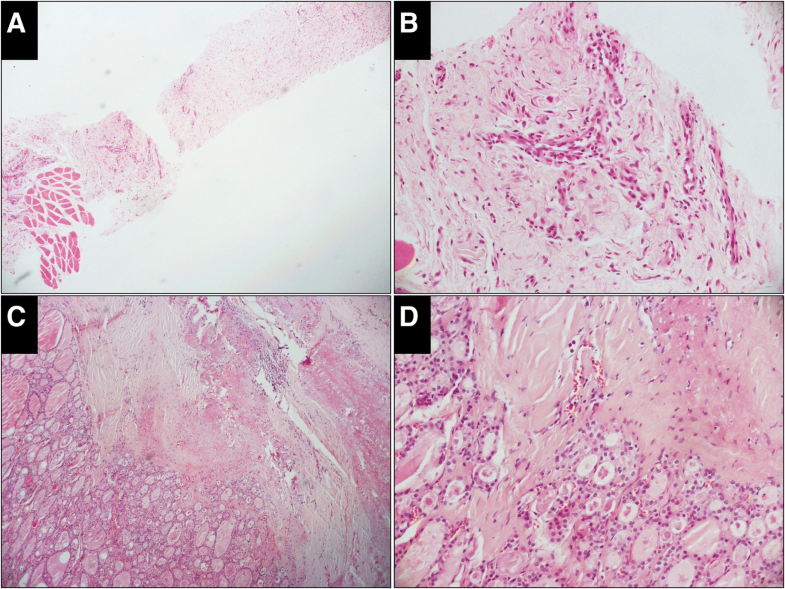 Pathological diagnosis based on core needle biopsy (CNB) should be different from a resected specimen because it is difficult to apply the histological criteria established for resected specimens to CNB due to sampling limitations. A pathological classification for thyroid nodule on CNB was first proposed by the Korean Group in 2015. The objective of this study was to test the reliability and clinical value of this proposal. According to the Korean proposal, the CNB diagnoses were categorized into unsatisfactory, benign, indeterminate, follicular neoplasm, suspicious for malignancy and malignant. A comparative study between the diagnoses of CNB and resected specimens was performed. The consistency was moderate (κ = 0.448). Combined indeterminate, suspicious for malignancy and malignant into a single group collectively referred to as “malignant” with the remaining merged into “others”, CNB demonstrated a 95.93% sensitivity, 97.30% specificity, 62.07% accuracy, 99.81% positive predictive value (PPV) and 62.07% negative predictive value (NPV) for preoperative malignancy evaluation. The Korean proposal for pathological classification of thyroid nodules on CNB is objective, operable and highly valuable. Thyroid nodule is a common disease of the endocrine system. The prevalence is 20 to 76% in the Chinese population as identified by high-resolution ultrasound, and 5 to 15% of nodules are malignant . It is very important to screen these malignant cases for further treatment. At present, the biopsy techniques for thyroid nodules used in practice include fine needle biopsy (FNB) and core needle biopsy (CNB). FNB aspirates cells for cytological examination with 22-27G needles, while CNB punctures tissues for histological examination with 18-21G needles. FNA was applied to the preoperative diagnosis of thyroid nodules for the first time in 1960s and has been the standard diagnostic tool since the 1980s [2, 3]. CNB was first used in preoperative diagnosis of thyroid nodules in the 1990s. CNB has not been widely used for many years because of the pain, tolerability and complications associated with the operation . However, with advances in CNB devices (i.e., spring-activated core needles) and the development of high-resolution ultrasound, these disadvantages have been significantly reduced. Recently, several large single-center studies have shown no significant differences between FNB and CNB in terms of pain, tolerability, or complications [5, 6]. In this case, the advantage of CNB for obtaining a large amount of tissue and providing more information on histological structures is highlighted. The National Cancer Institute, American Association of Clinical Endocrinologists/American College of Endocrinology/Associazione Medici Endocrinologi (AACE/ACE/AME), and the Korean Society of Thyroid Radiology (KSThR) have proposed CNB for thyroid nodules with previous nondiagnostic FNA results [7–9]. Some publications even indicate that CNB may be a feasible and effective diagnostic tool for initially detected thyroid nodules [10–12]. The application of CNB for preoperative diagnosis of thyroid nodules brings new challenges for pathologists. The lack of widely accepted pathological classification has led to inefficient communication between pathologists and clinicians and even misinterpretation of pathological results. Therefore, an effective pathological classification for thyroid nodules on CNB is urgently required by pathologists and clinicians. Of the very limited publications focusing on this issue, the majority are from Korea, the most important of which was the proposal of the Korean Endocrine Pathology Thyroid Core Needle Biopsy Study Group in 2015 . The terminology and criteria for thyroid nodules on CNB specimen were defined for the first time in the proposal. This is a significant advancement, but the objectivity, accuracy and clinical value of this proposal should be tested in more centers and more case studies around the world to further improve and optimize the criteria based on worldwide data. We retrieved 578 cases of thyroid nodules from Peking University First Hospital and classified them according to the Korean proposal. We tested the reliability of the Korean proposal and evaluated its clinical value by comparing classifications of a CNB sample to a resected specimen from the same nodule. Patients with thyroid nodules treated at Peking University First Hospital from January 2015 to December 2017 were reviewed. Cases of thyroid follicular lesions with both CNB and resected specimens were retrieved. CNB was used as the first-line preoperative diagnosis in all cases without prior FNB and was performed according to the recommendations from publications [10, 14]. All slides were separately reviewed by two pathologists blinded to the original diagnosis. Cases with inconsistent diagnoses were reviewed and agreement was achieved by discussion. According to the Korean proposal (Table 1) , diagnoses of CNB samples were divided into the following six categories: I. Unsatisfactory (Fig. 1); II. Benign (Fig. 2); III. Indeterminate (Fig. 3), including indeterminate follicular lesion with nuclear atypia and/or architectural atypia; IV, Follicular neoplasm (Fig. 4); V, Suspicious for malignancy (Fig. 5); and VI, Malignant (Fig. 6). • Suspicious for papillary carcinoma, medullary carcinoma, poorly differentiated carcinoma, metastatic carcinoma, lymphoma, etc. • Papillary thyroid carcinoma, poorly differentiated carcinoma, undifferentiated (anaplastic carcinoma), medullary thyroid carcinoma, lymphoma, metastatic carcinoma, etc. Referring to the six-classification method for CNB, diagnoses of resected specimens were also grouped into six categories as follows: I. Unsatisfactory, i.e., no thyroid tissue in the specimen; II. Benign lesion, including nodular hyperplasia, thyroiditis and benign neoplasm except follicular adenoma; III. Indeterminate lesion; IV. Follicular neoplasm, including follicular adenoma and follicular carcinoma; V. Suspicious for malignancy, i.e., suspicious malignant neoplasms of follicular epithelium except follicular carcinoma; and VI. Malignant, i.e., malignant neoplasms of follicular epithelium except follicular carcinoma. To simplify the categories for statistical analysis, the classifications were reduced from six to two as follows: two-classification method A, which combined V and VI into a single group collectively referred to as “malignant” with the remaining four categories merged into “others”; and two-classification method B, which combined III, V and VI into a single group collectively referred to as “malignant” with the remaining three categories merged into “others”. Fleiss’s kappa was used to test the consistency between the CNB and resected specimen classifications. A κ value < 0.00 indicates poor consistency, 0.01–0.20 indicates slight consistency, 0.21–0.40 indicates fair consistency, 0.41–0.60 indicates moderate consistency, 0.61–0.80 indicates substantial consistency, and 0.81–1.00 indicates almost perfect consistency . Sensitivity = Number of cases classified as “malignant” based on both the CNB and resected specimens/ Number of cases classified as “malignant” based on both the CNB and the resected specimens + Number of cases classified as “others” based on the CNB specimen but as “malignant” based on the resected specimen × 100%. Specificity = Number of cases classified as “others” based on both the CNB and the resected specimens/ Number of cases classified as “others” based on both the CNB and the resected specimens + Number of cases classified as “malignant” based on the CNB specimen but as “others” based on the resected specimens × 100%. Accuracy = Number of cases classified as “malignant” based on both the CNB and the resected specimens + Number of cases classified as “others” based on both the CNB and the resected specimens / Number of all cases × 100%. PPV = Number of cases classified as “malignant” based on both the CNB and the resected specimens/ Number of cases classified as “malignant” based on both the CNB and the resected specimens + Number of cases classified as “malignant” based on the CNB specimen but as “others” based on the resected specimens × 100%. NPV = Number of cases classified as “others” based on both the CNB and the resected specimens/ Number of cases classified as “others” based on both the CNB and the resected specimens + Number of cases classified as “others” based on the CNB specimen but as “malignant” based on the resected specimens × 100%. The study included 578 patients. Of them 146 were males and 432 were females, ranging in age from 20 to 81 years old with a median age of 38 years old. All of patients had no obvious discomfort during operation and no hoarseness after operation, only one patient presented with perithyroidal hemorrhage and achieved remission without any treatment. CNB specimen results: Of the 578 cases, 1 (0.17%) was unsatisfactory, 40 (6.92%) were benign, 31 (5.36%) were indeterminate, 17 (2.94%) were follicular neoplasm, 26 (4.50%) were suspicious for malignancy, and 463 (80.10%) were malignant (Table 2). Resected specimen results: Of the 578 cases, 21 (3.63%) were benign, 15 (2.60%) were follicular neoplasm, 3 (0.52%) were suspicious for malignancy, 539 (93.25%) were malignant, and none was classified as unsatisfactory or indeterminate (Table 2). CNB results from method A: Of the 578 cases, 490 (84.78%) were classified as “malignant” and 88 (15.22%) as “others” (Table 3). CNB results from method B: Of the 578 cases, 519 (89.79%) were classified as “malignant” and 59 (10.21%) as “others” (Table 3). The resected specimen results from method A and B were the same. Of the 578 cases, 541 (93.60%)were classified as “malignant” and 37 (6.40%) as “others” (Table 3). The CNB results were consistent with the resected specimen results in 498 cases and inconsistent in 80 cases. Of the 80 inconsistent cases, 1 was classified as unsatisfactory based on the CNB specimen but benign based on the resected specimen; 1 was classified as benign based on the CNB specimen but suspicious for malignancy based on the resected specimen; 20 were classified as benign based on the CNB specimens but malignant based on the resected specimens; 1 was classified as indeterminate based on the CNB specimen but as follicular neoplasm based on the resected specimen; 2 were classified as indeterminate based on the CNB specimens but suspicious for malignancy based on the resected specimens; 28 were classified as indeterminate based on the CNB specimens but malignant based on the resected specimens; 1 was classified as follicular neoplasm based on the CNB specimen but malignant based on the resected specimen; and 26 were classified as suspicious for malignancy based on the CNB specimens but malignant based on the resected specimens (Table 2). The consistency between the CNB and resected specimens classification is moderate (κ = 0.448). The CNB specimen classification was consistent with the resected specimen classification in 526 cases and inconsistent in 52 cases. All 52 inconsistent cases were classified as “others” based on the CNB specimens but as “malignant” based on the resected specimens (Table 3). The consistency between the classification of the CNB and resected specimens is moderate (κ = 0.546). Taking the classification of resected specimens as the gold standard, CNB demonstrates a 90.39% sensitivity, 100.00% specificity, 91.00% accuracy, 100.00% PPV, and 41.57% NPV for preoperative evaluation of thyroid nodules (Table 4). The CNB specimen classification was consistent with the resected specimen classification in 555 cases and inconsistent in 23 cases. Of the 23 inconsistent cases, 1 was classified as “malignant” based on the CNB specimen but was classified as “others” based on the resected specimen, and 22 were classified as “others” based on the CNB specimens but were classified as “malignant” based on the resected specimens (Table 3). The consistency between the classification of the CNB and resected specimens is substantial (κ = 0.737). Taking the classification of resected specimens as the gold standard, CNB demonstrates a 95.93% sensitivity, 97.30% specificity, 62.07% accuracy, 99.81% PPV, and 62.07% NPV for preoperative evaluation of thyroid nodules (Table 4). Pathological diagnosis of tumors with CNB specimens is unique. The reason is that, on the one hand, it is very different from the cytology observed with FNB and, therefore, either the diagnostic criteria or terminology should be different, and on the other hand, due to sampling limitations, it is difficult to apply the histological criteria established for resected specimens to CNB. In practice, the lack of uniform criteria and terminology often leads to deficiencies in the rigor and standardization of reports, consequently reducing the clinical value of CNB. Therefore, pathologists and clinicians urgently need a pathological classification that is not only based on the histological characteristics of CNB specimens but also objective, operable and highly valuable. This claim was first realized in the pathological diagnosis of lung cancer. The 2015 edition of WHO classification of tumours of the lung established the terminology and criteria for non-small cell carcinoma on CNB independently of resected specimens for the first time . This system has been widely welcomed by pathologists and clinicians in the last 3 years. The successful experience has prompted the international pathology community to understand the specificity of the diagnosis for CNB specimens. After lung cancer, various studies have been performed in other subspecialties. Unlike the preoperative diagnosis of lung nodules, the preoperative diagnosis of thyroid nodules around the world is still mainly dependent on FNB, although many publications have confirmed the safety of CNB for thyroid nodules . In China, CNB is applied in the diagnosis of thyroid nodules in only a few medical centers. Therefore, research on the pathological diagnosis of thyroid nodules by CNB is relatively insufficient. There are very limited publications and the majority are from Korea, the most important of which is the proposal of the Korean Endocrine Pathology Thyroid Core Needle Biopsy Study Group 2015 . The terminology and criteria for CNB thyroid nodule specimen were standardized for the first time in this proposal. This is a significant study, and the objectivity, accuracy and clinical value of the findings should be tested in more centers and more case studies around the world to improve and optimize the criteria based on a larger amount of data. In our study, of 578 CNB samples, only 1 (0.17%) was classified as unsatisfactory, and 31 (5.36%) were classified as indeterminate. Compared to the unsatisfactory rate (5–17%) and indeterminate rate (10–30%) of FNB published in papers [17–19], the rate of CNB is much lower. There were 28 cases classified as indeterminate based on CNB that were classified as malignant in resected specimens. In all of these cases, the histological pattern of the CNB specimens was entirely follicle, while that of resected specimens was a mixture of follicle, tubule and papillae. This demonstrates that sampling limitation is the main reason why the cases classified as malignant on resected specimens were classified as indeterminate based on CNB. Nevertheless, the atypia of the histological pattern and cell morphology of the CNB specimens highly suggested that the cases were malignant. There were 26 cases classified as suspicious for malignancy based on CNB that were classified as malignant in the resected specimens. 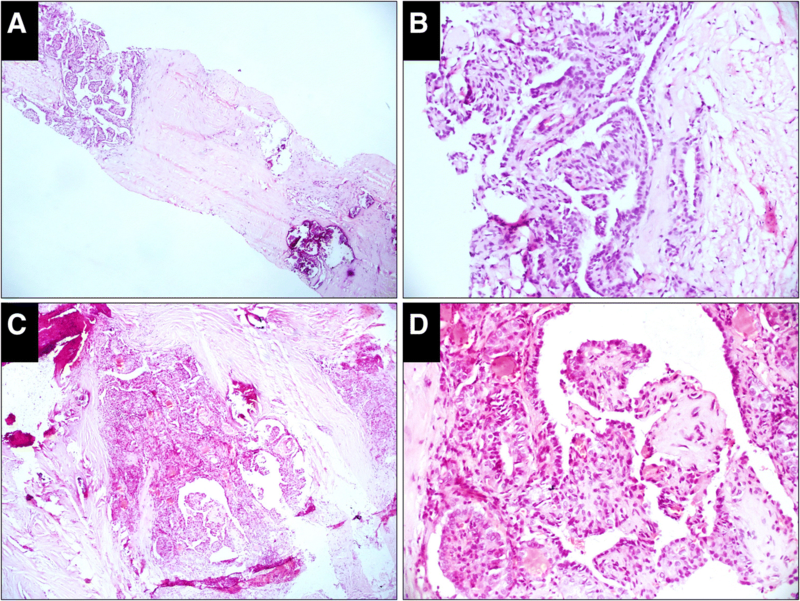 Of these cases, a very few fragments of papillae were found in CNB specimens in 10 cases, and several microfollicles composed of cells with nuclear features of papillary thyroid carcinoma were present in 16 CNB specimens. 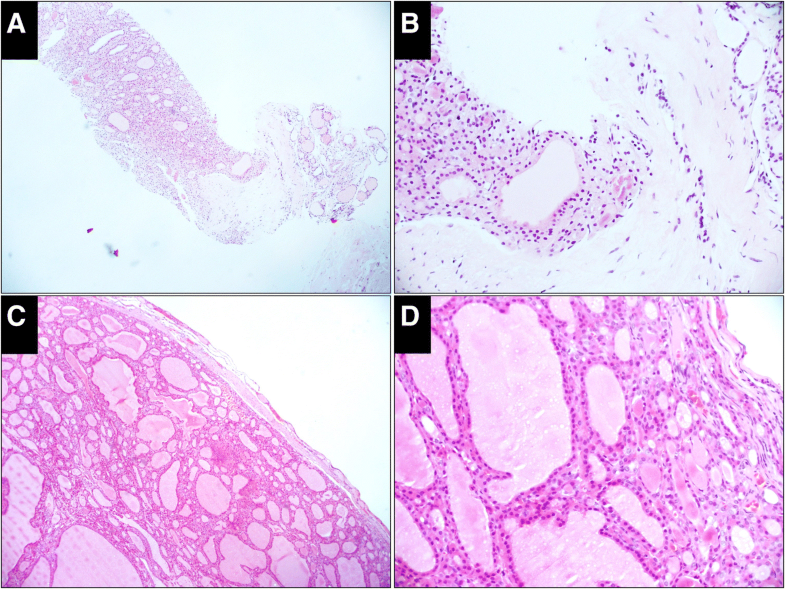 Although, the components with the histological characteristics of papillary thyroid carcinoma did exist in CNB in these cases, they were classified as suspicious for malignancy only because the quantity was insufficient to make a definitive diagnosis. Therefore, sampling limitation is also the main reason that cases classified as malignant on resected specimens were classified as suspicious for malignancy on CNB. By two-classification method A, the consistency between CNB classification and resected specimen classification is moderate (κ = 0.546) and CNB shows 90.39% sensitivity, 100.00% specificity, 91.00% accuracy, 100.00% PPV and 41.57% NPV for the preoperative evaluation of the malignancy of thyroid nodules. Therefore, we recommend that cases classified as suspicious for malignancy and malignant based on CNB be treated as malignant. By two-classification method B, the consistency between classification on CNB and resected specimens is substantial (κ = 0.737), and CNB shows 95.93% sensitivity, 97.30% specificity, 62.07% accuracy, 99.81% PPV and 62.07% NPV for the preoperative evaluation of the malignancy of thyroid nodules. Compared to method A, although 0.19% of the patients were at risk of over treatment, method B reduces the rate of missed diagnosis of malignancy by 20.50% and increases the accuracy of overall evaluation of malignancy by 5.02%. Thus, we think it may be the most beneficial strategy for cases classified as indeterminate, suspicious for malignancy and malignant based on CNB to be treated as malignant. Of the 40 cases classified as benign on CNB, 19 were classified as benign, 20 were classified as malignant and 1 was classified as suspicious for malignancy on resected specimens. A study of the morphology of the inconsistent cases shows that although the malignant components are obvious in resected specimens, they are absent in CNB. Failure to obtain tissue from the lesion is the only reason for the discrepancy. Therefore, cases classified as benign by CNB but considered malignant or suspicious for malignancy by ultrasound should be followed up closely and require rebiopsy. FNB is incapable of differentiating follicular neoplasm from nodular hyperplasia, while CNB is very useful in making this distinction. Of 17 cases classified as follicular neoplasm with the resected specimens, 16 were classified as follicular neoplasm and 1 was classified as indeterminate by CNB. Therefore, cases classified as follicular neoplasm by CNB should be treated with surgical operation. The capsular and vascular infiltration should be detected microscopically to further clarify whether the lesion is benign or malignant. CNB is a safe and effective method for the preoperative diagnosis of thyroid nodules. The proposal of the Korean Endocrine Pathology Thyroid Core Needle Biopsy Study Group suggestion 2015 is objective, operable and highly valuable for pathological classification of thyroid nodules on CNB. Under this framework, the inaccuracy and limitations of biopsy is the main cause of inconsistency between diagnosis based on CNB and resected specimens. The most beneficial strategy for cases classified as indeterminate, suspicious for malignancy and malignant on CNB may be to treat them as malignant. Cases classified as benign by CNB but considered malignant or suspicious for malignancy by ultrasound should be followed up closely and require rebiopsy. 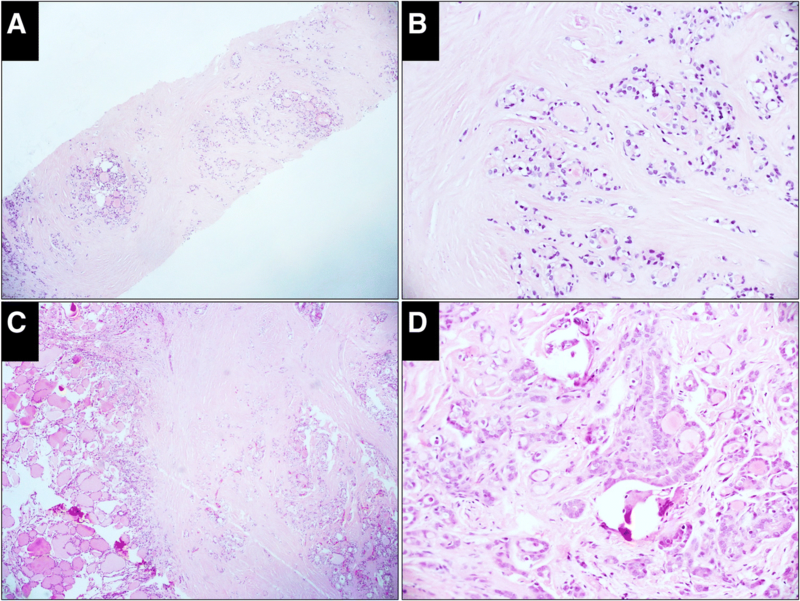 Cases classified as follicular neoplasm by CNB should be treated with surgical operation, and the capsular and vascular infiltration should be detected microscopically to further clarify whether the lesion is benign or malignant. YX initiated the study and wrote the manuscript. LY collected all data. LN and YZ reviewed all slides. TL supervised the research and revised the manuscript. All authors have read and approved the final version of the manuscript. All patient samples and clinical data using were approved by the Ethics committee of the Peking University First Hospital and the exemption from informed consent was approved as well [Ethical approval No. : (2018) Research No. 147]. Pitman MB, Abele J, Ali SZ, Duick D, Elsheikh TM, Jeffrey RB, et al. Techniques for thyroid FNA: a synopsis of the National Cancer Institute thyroid fine-needle aspiration state of the science conference. Diagn Cytopathol 2008;36(6):407–424. PubMed PMID: 18478608. 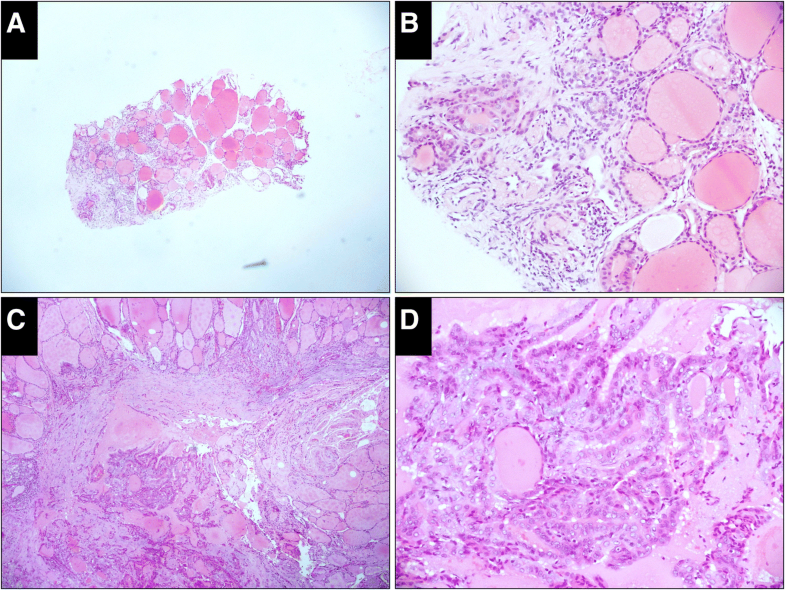 Jung CK, Hong S, Bychkov A, Kakudo K. The use of fine-needle aspiration (FNA) cytology in patients with thyroid nodules in Asia: a brief overview of studies from the working Group of Asian Thyroid FNA cytology. J Pathol Transl Med 2017;51(6):571–578. PubMed PMID: 29073758. Pubmed Central PMCID: 5700887. Choe J, Baek JH, Park HS, Choi YJ, Lee JH. Core needle biopsy of thyroid nodules: outcomes and safety from a large single-center single-operator study. Acta Radiol 2018;59(8):924–931. PubMed PMID: 29137498. Ha EJ, Baek JH, Lee JH, Kim JK, Choi YJ, Sung TY, et al. Complications following US-guided core-needle biopsy for thyroid lesions: a retrospective study of 6,169 consecutive patients with 6,687 thyroid nodules. Eur Radiol 2017;27(3):1186–1194. PubMed PMID: 27311538. Jeong EJ, Chung SR, Baek JH, Choi YJ, Kim JK, Lee JH. A comparison of ultrasound-guided fine needle aspiration versus Core needle biopsy for thyroid nodules: pain, tolerability, and complications. Endocrinol Metab 2018;33(1):114–120. PubMed PMID: 29589393. Pubmed Central PMCID: 5874187. Baloch ZW, Cibas ES, Clark DP, Layfield LJ, Ljung BM, Pitman MB, et al. The National Cancer Institute thyroid fine needle aspiration state of the science conference: a summation. CytoJournal 2008;5:6. PubMed PMID: 18394201. Pubmed Central PMCID: 2365970. Gharib H, Papini E, Garber JR, Duick DS, Harrell RM, Hegedus L, et al. American Association of Clinical Endocrinologists, American College of Endocrinology, and Associazione Medici Endocrinologi medical guidelines for clinical practice for the diagnosis and Management of Thyroid Nodules--2016 update. Endocr Pract 2016;22(5):622–639. PubMed PMID: 27167915. Na DG, Baek JH, Jung SL, Kim JH, Sung JY, Kim KS, et al. Core needle biopsy of the thyroid: 2016 consensus statement and recommendations from Korean Society of Thyroid Radiology. Korean J Radiol 2017;18(1):217–237. PubMed PMID: 28096731. Pubmed Central PMCID: 5240493. Trimboli P, Nasrollah N, Guidobaldi L, Taccogna S, Cicciarella Modica DD, Amendola S, et al. The use of core needle biopsy as first-line in diagnosis of thyroid nodules reduces false negative and inconclusive data reported by fine-needle aspiration. World J Surg Oncol 2014;12:61. PubMed PMID: 24661377. Pubmed Central PMCID: 3987871. Suh CH, Baek JH, Lee JH, Choi YJ, Kim JK, Sung TY, et al. The role of Core-needle biopsy as a first-line diagnostic tool for initially detected thyroid nodules. Thyroid 2016;26(3):395–403. PubMed PMID: 26651390. Kim HC, Kim YJ, Han HY, Yi JM, Baek JH, Park SY, et al. First-line use of Core needle biopsy for high-yield preliminary diagnosis of thyroid nodules. AJNR Am J Neuroradiol 2017;38(2):357–363. PubMed PMID: 27932508. Jung CK, Min HS, Park HJ, Song DE, Kim JH, Park SY, et al. Pathology reporting of thyroid Core needle biopsy: a proposal of the Korean endocrine pathology thyroid Core needle biopsy study group. J Pathol Transl Med 2015;49(4):288–299. PubMed PMID: 26081825. Pubmed Central PMCID: 4508566. Nasrollah N, Trimboli P, Rossi F, Amendola S, Guidobaldi L, Ventura C, et al. Patient's comfort with and tolerability of thyroid core needle biopsy. Endocrine 2014;45(1):79–83. PubMed PMID: 23673868. Landis JR, Koch GG. The measurement of observer agreement for categorical data. Biometrics 1977;33(1):159–174. PubMed PMID: 843571. Baier ND, Hahn PF, Gervais DA, Samir A, Halpern EF, Mueller PR, et al. 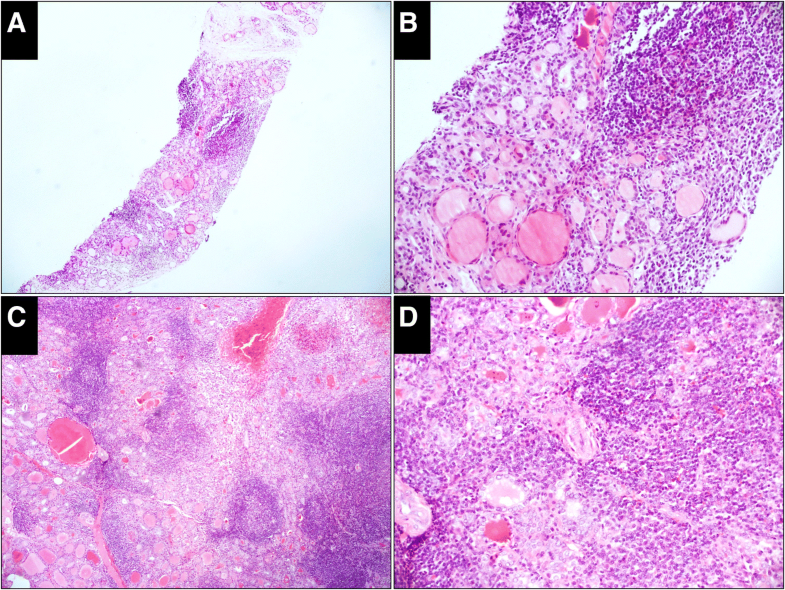 Fine-needle aspiration biopsy of thyroid nodules: experience in a cohort of 944 patients. AJR Am J Roentgenol 2009;193(4):1175–1179. PubMed PMID: 19770344. Zhong LC, Lu F, Ma F, Xu HX, Li DD, Guo LH, et al. Ultrasound-guided fine-needle aspiration of thyroid nodules: does the size limit its efficiency? Int J Clin Exp Pathol 2015;8(3):3155–3159. PubMed PMID: 26045833. Pubmed Central PMCID: 4440142. Seningen JL, Nassar A, Henry MR. Correlation of thyroid nodule fine-needle aspiration cytology with corresponding histology at Mayo Clinic, 2001-2007: an institutional experience of 1,945 cases. Diagn Cytopathol 2012;40 Suppl 1:E27–E32. PubMed PMID: 22619156.